When Henry Ford first introduced the Model T automobile, he famously said, “You can have it in any color, as long as it’s black.” (Or something like that.) Customization, and more importantly individualization, was not in the picture, due to cost considerations and other factors. But there is more to this Model T phenomenon than the extra marginal buck for painting one out of ten cars red instead of black. Ford gripped an era in which commonality was celebrated above abnormality. It is somewhat ironic that the innovative breakthrough known as the mass assembly line was really nothing more than a rubber stamp mass-producing identical icons. Iconic yet identical. It worked for Ford. But if he was in the food business in the year 2014, he would have failed, miserably. & Pizza is an assembly line of sorts, a line long enough on most weekdays that it tails out the front door and down the sidewalks of the District. If your patience awards you, your eyes will be glued to the array of “pre-determined” pizza creations listed on the menu or the mounds of sausage, meatballs, fresh mozzarella, onions, capers, fresh basil (and on and on and on…) at the heart of the assembly line, just before the salamander oven. There are many things I can say about the quality of the food at & Pizza, but I will say just three things. First, the dough and crust are excellent. Whatever they’re doing to the dough is working, and even the “multi-grain” option is decent. The dough, which is kneaded on the spot, travels slowly through the heat treatment expo until it emerges on the other side perfectly crispy and soft-chewy at the same time. Thin-crust, all the way. Second, the spicy tomato sauce is sweaty-good. The tomato sauce makes or breaks any pizza, and & Pizza’s spicy variety is a must-have. You won’t feel the heat during the first couple pieces, but by the third and fourth, sweet fumes will start coming up from deep within, provoking beads of sweat to form on your forehead. And you’ll know you’re enjoying it. Third, the runny egg. I get excited when I see fried eggs in a burger (okay, so maybe everyone’s doing it now…but it’s still good). 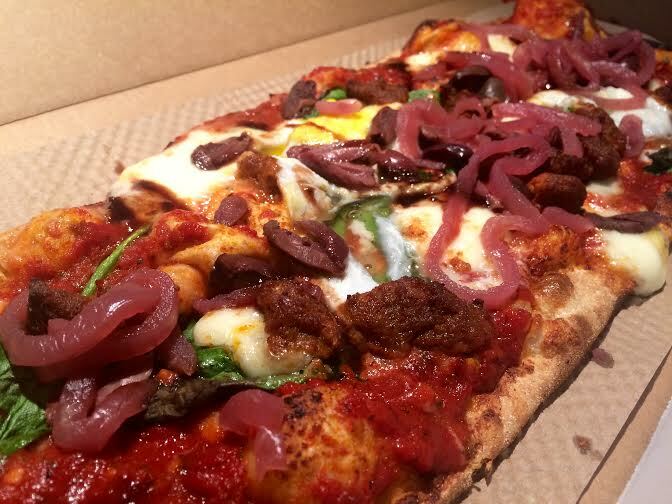 The Farmer’s Daughter pizza (pictured in this post) features two eggs, with two options – cooked through or “runny.” I opted for runny, and this is what happened. Crack one egg, place on one end of pizza. Crack another egg, place on the other end of pizza. Send through oven. What comes out are slightly torched yolks, just runny enough to trickle down the pizza like a second sauce bonding with the spicy tomato sauce. 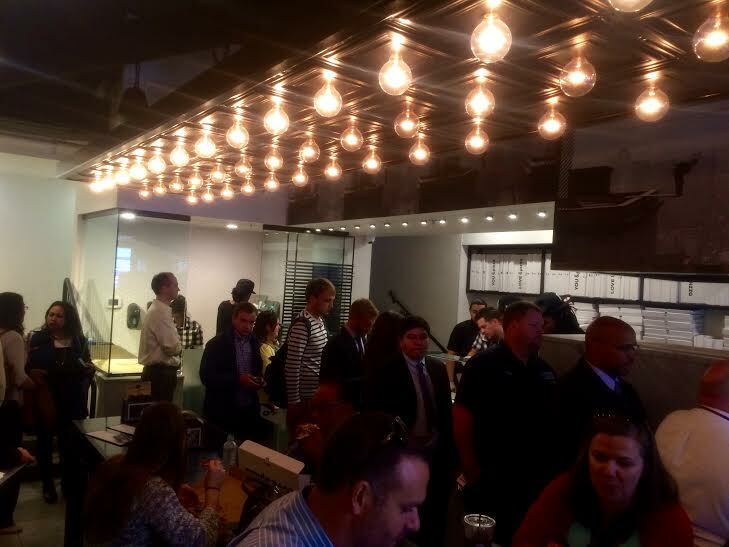 Sure, & Pizza has almost reached hype-status here in the District. It’s not too difficult to see at least a handful of folks walking around with the rectangular black and white box during the lunch hour. But there’s good reason for this hype. The current culinary clash is (1) I am the star chef, here is my creation, you will eat it and like it and lick my feet, versus (2) here is what we have, how can we put it together for your taste buds. It will be interesting to see how far this “individualization of food” movement carries. 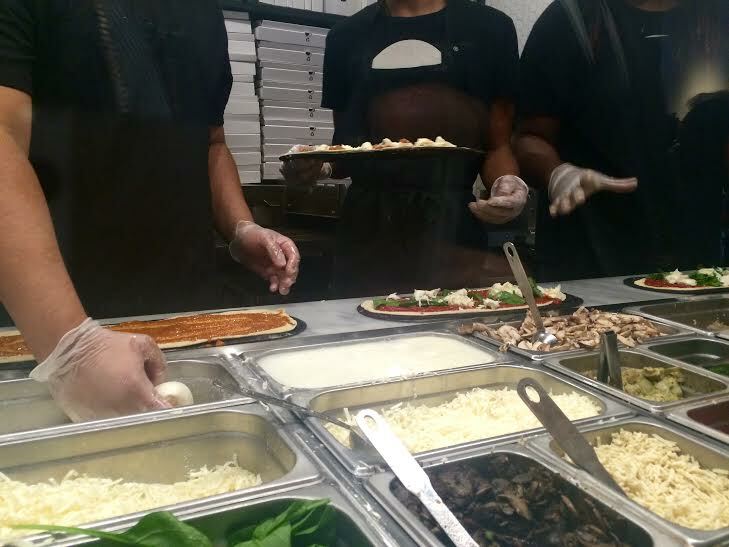 Fresh ingredients, abundance of choices and options, and reasonable price ($8-9 range for most & Pizza creations) are things that power joints like & Pizza. The Henry Fords of food are waning, and in their place, runny eggs will rise. 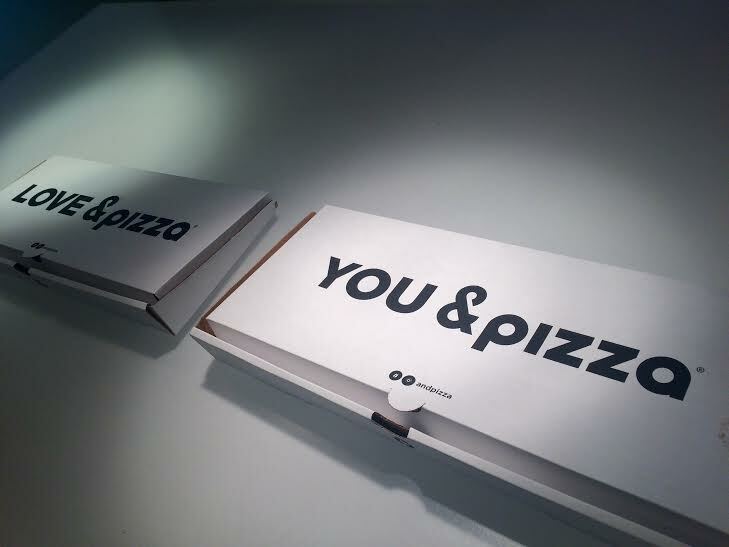 As they say, it’s “You & Pizza.” Just that.